Two inspiring SPI events highlight the growing purchasing power of women in solar. 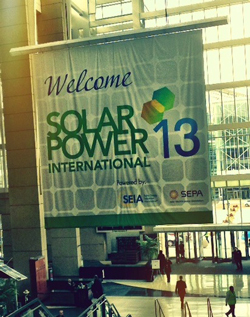 In October, Yelloblu joined thousands of industry leaders for the Solar Power International conference in Chicago. Amid the excitement of all-star executive panels and solar QuickTalks, we were pleased to see SPI’s focus on an underrepresented (yet growing) demographic: women in solar. Championed by industry icons including Julia Hamm, CEO of SEPA and Founder of Solar Power International, this year’s event placed greater emphasis on female leadership and sales strategies tailored to powerful female consumers. Though examples abound, we found two distinct events captured the burgeoning influence of women in the PV market. First, we’ll offer highlights from the sold-out Women in Solar Breakfast and the panelists that energized the room. Then we’ll share discussions at the “Shining a Marketing Light on Women" session, a pre-cursor to the first solar survey on female consumers. Dr. Christensen shared the movement toward more collaborative leadership and introduced the all-female panel as a pivotal launching pad for a larger movement. Of all the panelists, Carol Neslund of Enphase stole the show. Witty and self-effacing, Carol shared her experience of being a sole female lead at IBM and her current role at Enphase. She ended by calling for more peer-to-peer mentorship and directed female executives not to “pull the ladder up behind them” as they pave the path for future leaders. Leaving for the remainder of the show, the room buzzed with energy as women in attendance spoke about how they would apply the hard-fought lessons shared by the panelists. Hosted by #SolarChat founder Raina Russo and Identity3’s Glenna Wiseman, the discussion aimed to promote insights from a first-ever women in solar survey. After getting settled in the exhibit hall, Raina shared data from Marti Barletta of TrendSight Group, who wrote the book (literally) on marketing to women. Amidst the wealth of data, Barletta found that women initiate 80 percent of all home improvements, but a whopping 70 percent feel misunderstood by marketers. For Glenna and Raina, this represents a serious disconnect between key purchase decision makers and providers, and was the impetus for the female-oriented survey. This and host of other anecdotes helped whet our appetites for the final survey results, due to be released mid-November 2013 during another #SolarChat tweet series. The first of its kind, the survey promises to offer unique insights into female purchasing decisions and new marketing methods; elements PV providers would be wise to internalize as the role of women in the industry expands.